Assisting each facility with routine maintenance and provide vehicle maintenance tracking reports. Establish qualified repair centers for each level of vehicle repair. Negotiate reduced labor rates with local repair centers. Managing all warranty claims on warrantable repairs. Handling unscheduled maintenance to ensure that your vehicle is diagnosed and repaired in a timely manner, reducing down time and repair cost. Monthly billing plans in which Tri-State will immediately pay vendors upon service completion eliminating the need for payment at the facility level. Providing OEM bus parts at a reduced cost to Tri-State Fleet Management customers. Taking advantage of 30 years experience in Fleet Management for companies across the United States. To achieve the Lowest Cost of Ownership, let Tri-State Fleet Management be your partner in vehicle maintenance. For information on pricing as well as the many additional benefits offered, contact us via the information below and we will gladly discuss any and all possibilities to suite your maintenance needs. 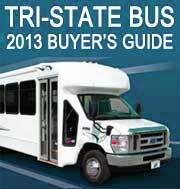 To get your FREE Tri-State 2013 Bus & Van Buyer's Guide Click Here! We are currently seeking an experienced, qualified Sales Person to join our growing Sales Team. Apply Here! Tri-State Fleet Management, a division of Tri-State Van & Bus Sales, is a minority owned small business offering complete Fleet Management and Repair Services Nationwide!